I don’t know about you, but I must sleep in some crazy positions because my muscles always feel really tight when I first wake up. To loosen up before I start my day, I like to do a few gentle yoga poses to limber up a bit. 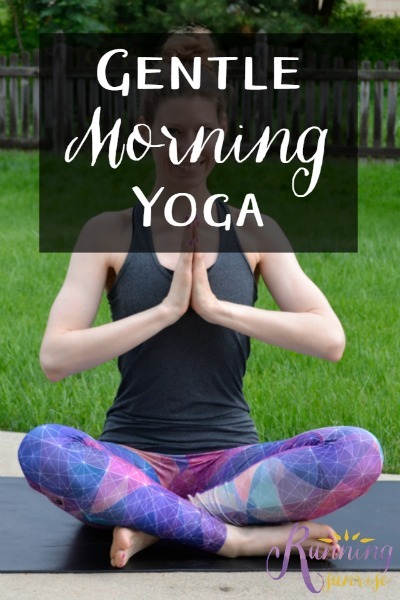 Here are some of my favorite poses that I use in my gentle morning yoga routine to help me wake up and get ready for my day. Are you just starting on your yoga journey? Learn more about my Yoga Bootcamp and how it can help you jumpstart your healthy living journey! 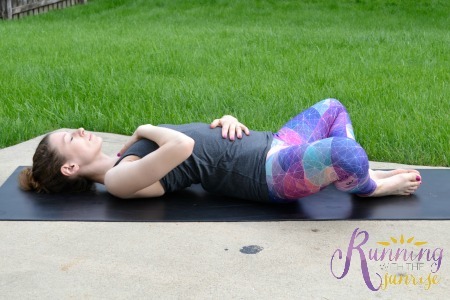 Supine twist is a great pose to help you loosen up your back. There are several things you can do with your legs: you can keep one leg long and straighten or bend the leg that crosses over your body, you can bend both knees and take both legs to the side, or you can even spice things up with eagle legs. Whatever leg variation you choose, it’s really important to keep your shoulders glued to the mat. Don’t worry how far your knee(s) get to the floor. You always have an option to place a block, blanket, or pillow beneath the knee that’s crossing the body to help support it. This is a great easy pose to help open up the outside of the hips. Make a figure four with your legs by placing your left ankle just above your right knee (or vice versa to stretch the other side). Reach through the hole of the “4,” grab ahold of your shin, and gently pull toward you. You should feel a nice stretch through the outside of the hip. Be sure to stretch out both sides! This pose is wonderful for opening up the inner thighs. You simply bring the soles of your feet together and let your knees fall to the floor. If your hips are tight and you feel too much of a pull on your hips, place a yoga block, blanket, or pillow underneath your knees to help support the legs. 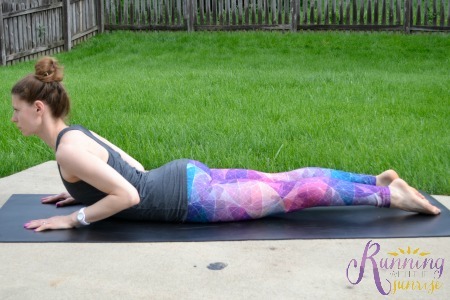 I love this easy twist for stretching out the shoulders and upper back. You simply come to an easy seated position and twist to the side. If your upper back is relatively flexible, think about lengthening your spine with each inhale and twisting a little deeper with each exhale. This twist should feel good; if it feels like too much, don’t twist as deeply. I love cobra as a gentle pose to help open the chest. You simply lie on your stomach, place your hands beneath your shoulders, and gently press up, keeping a bend in your elbows. Be sure to keep your shoulders back, which will help stretch out the chest. You’ll also feel a little stretch through your abs. I love Rag Doll in the morning to help me release my hamstrings and my neck. Stand with your feet hip width apart (that’s only about two fists’ distance). Fold forward, bending your knees as much as you need to. Sometimes it feels good to bend your knees a lot and let your chest rest on your thighs. You can grab for opposite elbows with opposite hands, or just let your arms hang. Be sure to release any tension from your neck–I love to shake my head “yes” and “no” to help me release my neck in this pose. To start, hold each of these poses anywhere from five breaths to 30 seconds. If it feels good, you can hold the poses for longer, especially the poses that help you release muscles like rag doll and reclining pigeon. The leggings I’m wearing are the Geometrica Legging from Inner Fire Apparel. I love that they’re made with polyester that comes from recycled water bottles. Cute and eco-friendly! Want your own pair? Use coupon code bethb for 15% off your purchase! Do you have a favorite time of day to practice yoga? Do you stretch when you first wake up? I actually like to do these poses at the end of the day too! Definitely! Great for any time you need to gently move your muscles and joints. YES. last summer, this + my lacrosse ball were the only things that kept me functioning period. There are few things like a good supine twist (once you get a bit limber) and get that satisfying pop in your lower back…. ah sweet release. I don’t know if I sleep completely differently or what these days, but I don’t have to do quiet so much of it in the mornings any more? Maybe I’m just not working myself hard enough, lol. Supine twist is the best. Hopefully you’ve found a better sleeping position and that’s why you’re feeling better. 🙂 I know I do when I don’t sleep on my shoulder all wonky. This is great! 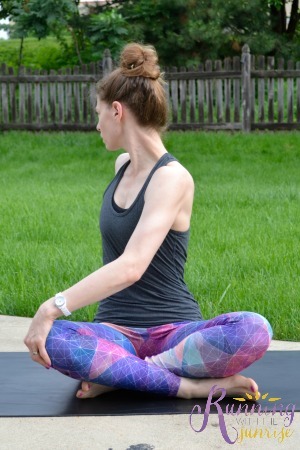 I’m learning yoga via the blogosphere and this is super helpful! I wish I could do yoga first thing in the morning because I’m so stiff and achy when I wake up… but I don’t have time 🙁 Usually, I try and find time during the workday – it really helps, because sitting in a chair for nine or ten hours in a row is no picnic! Thanks! Glad you found the post helpful, Jason! Yoga at any time of the day is helpful, especially if you’re a desk-sitter. So many muscles get so tight from sitting, so you’re being really smart by loosening things up periodically! Your whole post my brain was screaming BUT WHERE DID YOU GET YOUR PANTS?! 🙂 They are amazing. Hotel room yoga in LA? I think so. These look a lot like some of the post run stretches I do – I didn’t know they had yoga names. I NEED this!! I wake up so stiff and sore. My back has been giving me issues for years. I love all of those poses, I just need to take the time and do them every morning (instead of sitting at the computer like I’m doing now 🙂 ). I do the same thing a lot of mornings, so no judgement here! Hope you can find something that helps your back feel better!